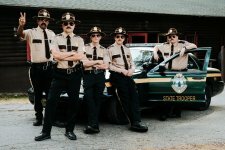 Super Troopers 2 Movie The mustache rides. Again. Everyone's favorite law enforcement team is back by popular demand with the long anticipated follow up to the cult comedy classic. 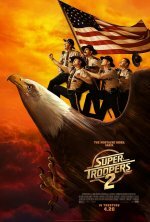 Super Troopers 2 release date was Friday, April 20, 2018. This was a Nationwide in theaters release. 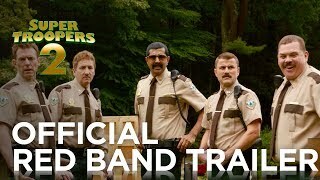 Broken Lizard raised more than $4.5 million to produce the film during a crowd-funding campaign on Indiegogo (9/14/16). 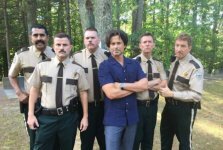 Rob Lowe plays Guy Le Franc, a former hockey player and the current mayor of a Quebec Canadian border town (Deadline.com, 9/14/16). Emmanuelle Chriqui plays Genevieve Aubois, a French/Canadian cultural attaché focused on relations with the U.S. (Deadline.com, 9/15/16).